I cannot seem to get this to work, none of the guards have the armour equipped, I have messed with the load order, adding this mod last and I can add the items via console commands, so they are there. I also used a program to unpack the bsa file and so forth. 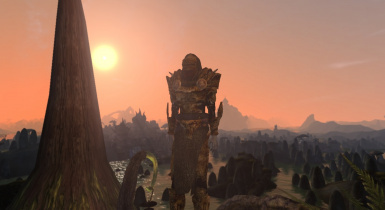 The only mod I have that I can think of conflicting is NX9_guards_complete or possibly Rise of Telvanni, Uvirith's legacy, Building up Uvirith's legacy and/or LGNPC Tel Uvirith. I really like the armour, so kind of miffed that no guards wear it. Also, would be nice to get the item ID's, since console commands seem to be the only way I can get them, specifically referring to the champions one. Also forgot to say that I have already checked it out with a newly created character, like I read solved the problem for someone else and still no luck. I'm not very mod literate either, so no clue how to possibly fix it. Check it on the new game. Some mods can store NPC inventories into save file and those can't be replaced by mods. 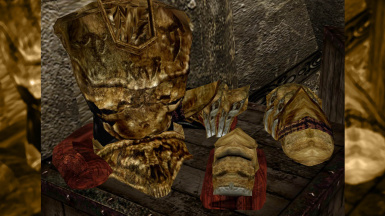 What armor class does this armor fall into? 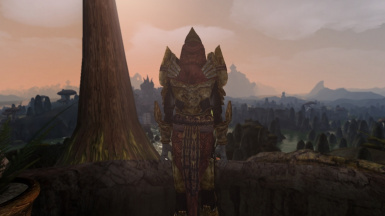 That armored robe though... Like seriously, I've been playing morrowind for nearly 14 years the armored robe actually intimidates me slightly. It's been a long time since anything in morrowind intimidated me, much less the guards. I think the last time would have to be the first time I dualed Vivec, I lost three times before I beat him, lol. Anyway I just want to say that I love everything about this mod, from the idea behind it to the quality of the mod itself. 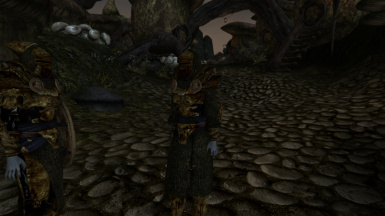 I've always loved the Telvanni questline, and always admired them for their many ups and downs. This mod is simply amazing and it gives me a new reason to love the Telvanni. I've tried to install your mod putting the files .bsa and .esp in DataFiles, but the game gave me the ERROR SIGNS, so I registered the .BSA by editing morrowind.ini; the errors still remains. Meshes\A\A_BONEMOLD_TL_HELMET2.NIF cannot load file in Meshes\A\A_BONEMOLD_TL_HELMET2.NIF. Will use the default object Marker_Error.NIF." Meshes\A\A_BONEMOLD_TL_AR.NIF cannot load file in Meshes\A\A_BONEMOLD_TL_AR.NIF. Will use the default object Marker_Error.NIF." Meshes\A\A_BONEMOLD_tl_cl.NIF cannot load file in Meshes\A\A_BONEMOLD_tl_cl.NIF. Will use the default object Marker_Error.NIF." Please, i really like to continue and enjoy the game with your mod, can you help me? I hope loose files helped you. I'm actually having the same problem. I'm pretty new to modding, what do you mean by loose files? This mod's resources (meshes, textures etc.) are packaged in a BSA (Bethesda Software Archive) file, it's quite common in the Russian modding community to package resources in that way. The single BSA file is placed in the Morrowind\Data Files folder and morrowin.ini edited to include its name. The game will then look in the BSA file for the resources it needs to run the mod. Loose files is how most mods are distributed here on Nexus. Rather than the resources being in a single BSA file the individual resource files are included in the download; the resource files are scattered into the Meshes, Textures, Icons and other subfolders of Data Files. Probably Stavrogruin sent Tipho88 a non-BSA distribution via PM. You can use a BSA tool (BSA Unpacker, BSA Browser...) to manually extract the files from the BSA if you wish. Be careful on where the files end up. within Wrye Mash program, go to mod tab then click on this mod which is having problem (not green color) then you click on the selected mod in the right-side field where more details have showed up after you selected the mod from the main list (click anywhere in the right-side field), and it should ask you if you want to fix something, you say yes. then click SAVE at bottom right. Also the readme might (should) say what .BSA to register it to by editing the .ini file under the archives heading... but I'm not sure. Sorry for the lazy advice but at least you can now google some of the stuff i mentioned. Dude, you should really get involved with Tamriel Rebuilt, they'd just eat up this stuff. Hello! This mod looks fantastic, but I've been having some trouble getting it to work. 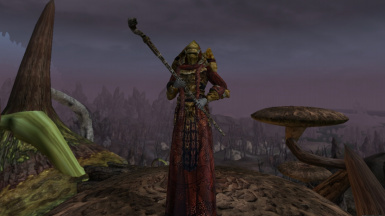 I've placed both the ESP and BSA in the data files folder as per usual, checked it in the launcher and activated the BSA in the .ini, but when I load up the game, the Telvanni guards are still wearing their same old armor. No errors or missing meshes/textures or anything like that. I tried modifying my load order, but that doesn't seem to be the case either. Any ideas? 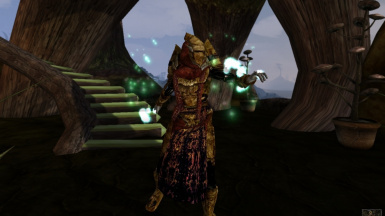 It does sound like a later loading mod is overwriting the changes made by Telvanni Warriors. Are you using a TESTool-generated Merged Objects plugin? Thank you for the response! I had not been using it, no. I did download TEStool after you mentioned it to see if I could get any results from the quick fix -- no dice (though it did smooth out a number of other unrelated-to-this-issue conflicts, hooray! ). I did run a conflict report with all of my mods to see if I could puzzle something out, and the conflict appears to be coming from the Morrowind Patch 1.6.5 beta, but modifying my load order accordingly didn't fix the issue, and I tried temporarily deactivating the patch to see if I could get any results that way, but nope, they were still wearing their same old armor. I have only moderate knowledge of moddding, so I hesitate to try anything too drastic without some advice. I got the same issue with my old save game that I created befor start to work with mod. As I understand it, guards inventory is written in save-file. Try to kill some of them and wait for their respawn to see if they got new items or start new game. In response to post #19423539.